Context. The underlying tech is not new. It's been used by industry majors for a long time. But curiously, it has never become an audiophile mainstay. Some players like NAD or TACT have tried to make it real but success each time has been mild. Even Marantz recently released some lovely all-in-ones able to stream PCM, receive various digital inputs and directly convert from PCM to PWM without any intermediary D/A conversion process. But these devices were aimed at the entry level with limited power which didn't really target the audiophile market per se. Indeed, these technically logical initiatives don't seem to have met with much of an appreciative echo in the audiophile sphere thus far. Regardless, one thing which was never yet available was a DSD network player using D/D technology to drive a pair of hungrier loudspeakers with nothing else but a pair of speaker cables. Now the small Pixel Magic team have decided to finally make this dream come true and here we are: the newest and most budget Lumin device is now available to stream your DSD library directly into your loudspeakers. How is that possible, you ask? You must stop thinking about making money selling now useless devices when you can shorten the signal path this dramatically. In my opinion, that is the most important obstacle to increasing the popularity of fully digital amplifiers amongst audiophiles: they are perhaps not expensive enough to suggest real credibility. But it's hard to make them too costly what with a limited number of parts. Most the time those are of common grade like inexpensive chip sets made by big global companies such as Texas Instruments or ST Microelectronics. They are mainly targeted at AV gear and car audio in far bigger numbers than the highly fragmented hifi industry. So what's at the heart of this new kid to hifi town? The new Lumin M1 relies on two TI TAS5558 chips with their companion TAS5624A (one per channel) which convert a digital pulse-coded signal (PCM) to a pulse width-modulated signal (PWM). The PCM signal is multiplied by at least one derivative to obtain a sufficient sample rate for the PWM signal. The TAS5624A is a thermally enhanced class-D power amplifier based on the TAS5614A chip which uses large Mosfets for improved power efficiency and a novel gate drive scheme for reduced idle losses at low output signals, leading to reduced heat sink size. 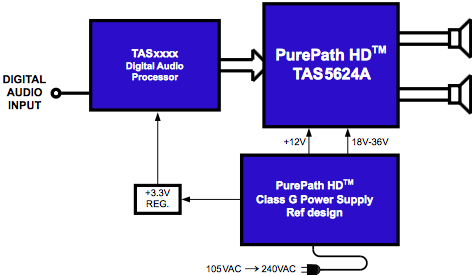 The TAS5624A uses constant voltage gain. The internally matched gain resistors ensure a high power supply rejection ratio, giving an output voltage dependent only on the audio input voltage, supposedly free from any power supply artifacts. In this very direct conversion process, the main issue remains the prediction and address of nonlinearities and noise through sophisticated low-pass filtering and feedback techniques or DSP. The TAS5558 chipset used by Lumin is originally an 8-channel digital pulse width modulator with digital processing and sample rate conversion. As its ASRC consists of two separate modules which handle four channels each, it's possible to support two different input sampling rates. Lumin have nonetheless chosen a single sample rate of 176.4kHz which provides full compatibility with both PCM and DSD files.